Cortech’s latest major software release Datalog 5 now integrates with the DVTEL Latitude 6.3 servers. 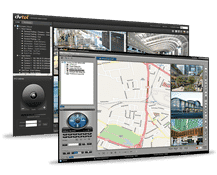 DVTEL is a developer, designer and provider of video surveillance software and hardware technologies including cameras, encoders, NVRs, video management systems, thermal cameras and intelligent video analytics. -Time and date search for playback of manually selected recorder cameras. -The option to issue preset commands on alarm and the automatic replay of alarm events on the Datalog screen for video verification. -Playback of cameras is via the Datalog on screen display with up to four simultaneous cameras synchronised by time and date with playback controls of fast forward, reverse, pause etc. -Up to four cameras can be displayed simultaneously in either quad view mode or through one single camera in live or replay mode. -The option exists to incorporate the use of the Datalog camera icons, enabling the cameras to be dragged from the Datalog maps and dropped on to DVTEL window and to perform the required operations [playback, PTZ etc.] with the selected cameras. -Live cameras can be viewed with the ability to control any PTZ cameras. In addition to the basic DVR functions Datalog also implements a Virtual Matrix interface allowing it to take control of any Latitude Control Centre instances that are available through one of the connected directories. The matrix interface allows remote camera switching and changes of ‘video wall’ layouts as required for normal viewing and on alarm. -Ensure maximum security – flexibility in managing IP video, audio and data. -Reduce operational costs – Latitude’s effective video management helps reduce resources. -Open platform – Latitude is an open platform that supports all leading camera vendors and is ONVIF Profile S compliant.